Enormous cacti, silhouetted by the setting sun, are the universal symbol of the American Southwest. These majestic plants, the Giant Saguaro, are found in only a small part of the world, at the northern edge of the Sonoran Desert. Saguaro National Park protects the most impressive forests of these sub-tropical giants, all along the fringes of Tucson. TThe city separates Saguaro National Park into two districts located approximately 30 miles (an hour's drive) apart from each other: the Tucson Mountain District, or Saguaro West, and the Rincon Mountain District, or Saguaro East. Subtle differences make both areas worthy of a visit. The Saguaro Wilderness, a large, roadless backcountry in the Rincon Mountain District, provides outstanding opportunities to experience the rugged beauty of the Sonoran Desert. As summer winds down in many states and the harbingers of autumn arrive – a slight chill in the air, turning leaves – things start to “heat up”at Saguaro National Park. From fall to spring, the Southwest is breathtaking. The summer monsoons bring fiery blooms of ocotillo, aster, barrel cacti, morning glories, and summer poppies. In early September, you may catch one of the desert's brilliant lightning shows. As the monsoons subside, animal activity builds. Bats and hummingbirds prepare for early October migrations, while butterflies, bees, wasps, and beetles flock to their favorite flowers. 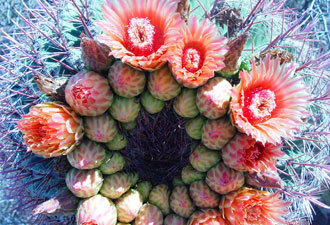 Fruiting cacti, desert hackberries, and wolfberries nourish gorging birds. Gila monsters and snakes seek their winter burrows. Hawks, kestrels, Merlins, and falcons arrive to set up winter homes. For human visitors, too, winter is delightful, with mild, warm days averaging 65°F (19°C) and cool nights averaging 40°F (5°C). 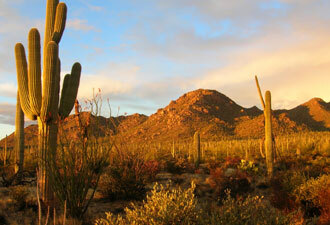 Saguaro National Park offers guided walks and talks throughout the winter season (November through March). Programs vary from easy strolls to advanced hikes. In August, night walks take place every other Friday. Star parties are planned monthly from October to April. 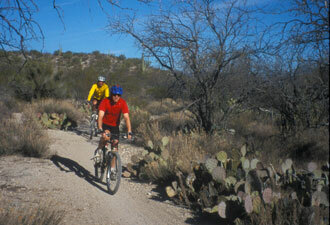 Special annual programs include the Holiday Car Caravan in December and the Annual Fiesta de Saguaro in March. Head to Saguaro West (pdf) and take a short hike on the Valley View Overlook Trail to see the Avra Valley and distant mountain ranges. A trip to Signal Hill Picnic Area reveals hundreds of ancient petroglyphs. For a deeper look into the Giant Saguaro, stop at the Red Hills Visitor Center for an orientation program that offers a Native American perspective on this plant, plus a chance to take home a taste of the desert in the form of prickly pear jelly or saguaro fruit syrup. In Saguaro East (pdf), a scenic auto/bike tour around the Cactus Forest Loop Drive offers incredible views of the Rincon Mountains, where you'll find a surprisingly lush desert oasis before you. A one-mile loop hike along the Freeman Homestead Trail will teach you a little about homesteading in the desert and modern Tucson. If you have a taste for adventure and a couple of days, we recommend a trip into the Saguaro Wilderness to visit Manning Cabin, which was built in 1905 by Levi Manning, a former mayor of Tucson.